We seldom pause to consider how we got to go to school. We were enrolled in kindergarten in a neighbourhood school, progressed to middle and high school, then continued on to college, university, trade school, or other training to carry us through life. 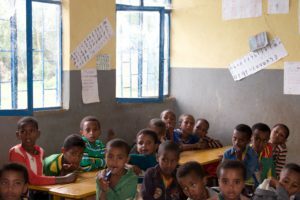 For children in Wotet Abay, a small town 50 kilometers south of Bahir Dar in Ethiopia, schooling has been a challenge. With 2,033 students, the Wotet Abay Elementary School was struggling to meet the learning needs of its community. Currently, twenty percent of the children entering grade one are between ages eight and 12. This late enrolment, a serious detriment to learning, has been attributed to a number of factors: a distance too far to travel, families needing their children for work, inadequate physical conditions of the school, and poor quality teaching. A shortage of classrooms meant staging two shifts of classes per day, with an average of 60 students per shift for grades one through eight. Classrooms in the mud-structure buildings were dark and dilapidated, and filthy, makeshift latrines offered no privacy for students or staff. In 2017 big changes were being made at the school, and CEF was there to help. Approached by the Frances G. Cosco Foundation (FGCF) to support overall improvements being made at the school, CEF stepped up with funding to construct latrines and establish teacher training and a greening program. CEF funding for teacher training helped them move beyond the traditional “chalk and talk” methods of instruction. “Our training focuses on student-centred learning,” explained Gina. “We use different teaching methods for different types of learners, and many more hands-on teaching methods and aids.” One aspect encouraged teachers and administration to establish reading, sports, and health clubs. These didn’t existent previously, but are now thriving with growing numbers of students. FGCF’s teacher training expert Abiyot Ashenafi, based in Bahir Dar, now oversees ongoing training. He manages planning, facilitating, maintaining best practices, modeling and monitoring student-centered instructional strategies, and measuring of students’ academic growth. CEF’s funding of a greening program took root to further enrich the school’s learning environment. The planting of fast-growing, indigenous canopy trees will in three years provide shade for classes held outdoors, and keep indoor classrooms cooler. Fruit and vegetable trees, such as mangos and avocados, were planted to educate about agriculture and farming methods. Future sales from the garden’s harvest will generate needed income for the school, and support costs of uniforms and school supplies for destitute families.